Your Goal, what you or your character wants to do. Typically, the end objective is completing the story or winning the game, which often includes gaining skills or power, often by leveling. Whatever the player has to do to complete the Objective. If the objective is “Collecting 10 Wolf Pelts” then the action would be getting those 10 wolf pelts. Zones do not necessarily denote geographical area, rather they are an abstract area within which non-interrupted action is reasonably possible. Any time you have to stop what you are doing to travel, wait for a loading screen, or for whatever reason stop completing quests, you have left the zone. Anything that changes another objective or story element by virtue of completing an objective. 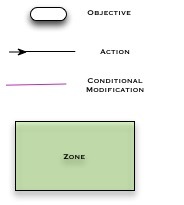 Objective and Action that are found within a zone and not connected to each other. When you walk into a city in WoW and see a bunch of potential quests, this is a distributed grouping of objectives. When there is an Objective that is not preceded by another, that objective has an implied action of having to actually find your initial objective. 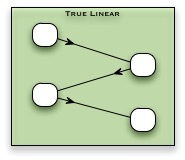 You can find Linear Trees anywhere you are given a decision in a game. It is the embodiment of choice in interactive narrative. 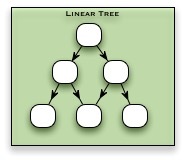 Linear trees can be universal or exclusionary. 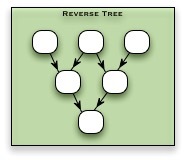 Universal trees allow every option to be accessed regardless of which objective is completed first. 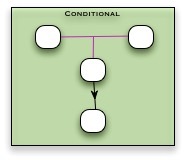 Exclusionary trees only allow one line of choices to be accessed. 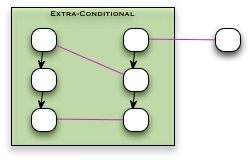 The most common objective pattern by a wide margin. Call of Duty, Bioshock, Last of Us, Arkham City, Portal; Any game that doesn’t allow you to make a choice in the narrative. True Linear, though, is by no means a lesser form of interactive storytelling, but it is one that relies on a number of fixed points in your narrative. It is a good way of telling the story you want to tell, but often at the cost of replay-ability. 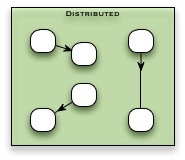 A form of objective pattern that requires the result of disparate objectives to access a new set of objectives. Most objectives are conditional in one way or another, often by Level, location, affiliation, or other common flags. If you want anything to be repeatable, it has to be cyclic. 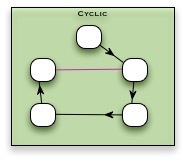 The conditional modification in the cycle serves to change the conditions of the cycle itself, either by making the initial objective available again, or by changing some aspect of the cycle to make it more interesting to the player. Repetition is the enemy. Mass Effect is a great example of this. Though it is an open world, you get guided along the narrative simply by virtue of following the action. When done right, it gives the player the sense of making their own decisions. When done wrong it comes across as railroading. 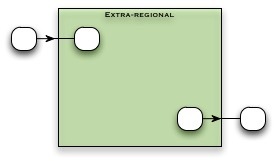 When an Objective’s source, the action leading up to it, crosses a regional boundary. Any time an NPC tells you to “Go check in with _____ over at ____” that is typically an extra-regional objective. It is a great tool to get your player to start in on the next set of Objectives. Lord Of The Rings Online has examples of both really good and bad extra-regional quests. On the better end, LOTRO will use them to guide the player to the next area, creating a more intuitive objective pattern. On the other hand, LOTRO has extra-regional fetch-quests, which require you to travel all the way across the absolutely massive map just to talk to an NPC. Often underutilized in creating a story that can influence itself. It helps provide a bit of realism when, if you save a group of soldiers, those soldiers help make another quest easier. This is an early draft of the first section of the Eons Lost demo, and its what my workflow looks like. 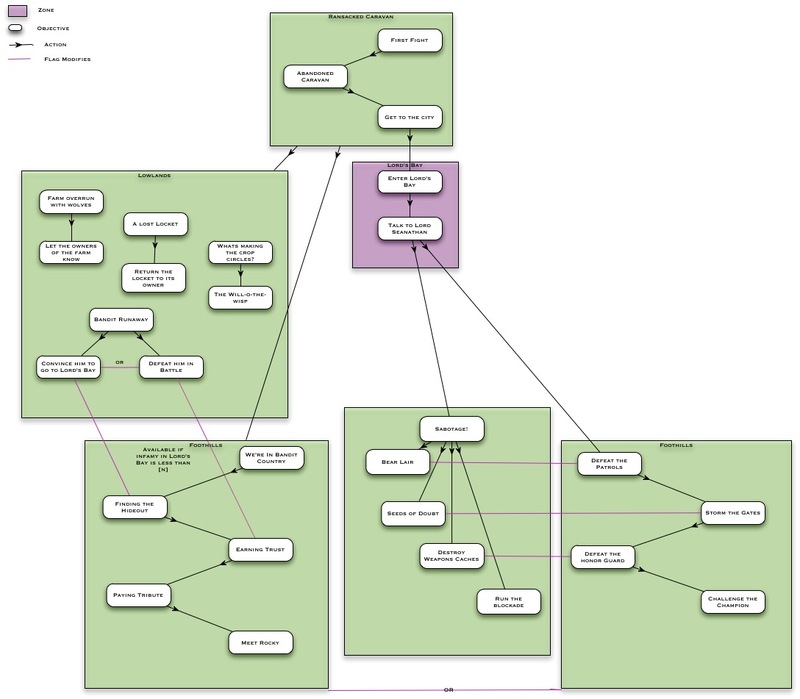 As an added note: You can play with the ‘resolution’ of your mapping. If you can define your narrative in 6 objectives, its a much easier matter to break those individual objectives out into a full narrative. Put simply: You can map your objectives on a Macro or Micro scale. All of these objective patterns don’t exist in isolation of each other. Most stories are a combination of the available narrative forms. A story is more interesting to play if it defies repetition and rewards creativity. And while this system works in describing Explicit Narrative, the story we want to tell the player, it doesn’t do so well in trying to map out Emergent Narrative, the story that a player creates for themselves over the course of the interactions. But the fact is, you can fill in Explicit gaps with opportunities for Emergent Play. The Arkham Series does this wonderfully. Though the Objective Progression is completely linear, it offers many varied ways to complete each instance. If you have to clear a room full of goons, there are many different ways you can do it, go all out and not care if they see you, or take down every last one of them without being seen.